The starting point of this proposal is a vertical experience as a complement to the horizontal condition of the Ordos plateau, a new topography that can take full advantage of its surroundings. 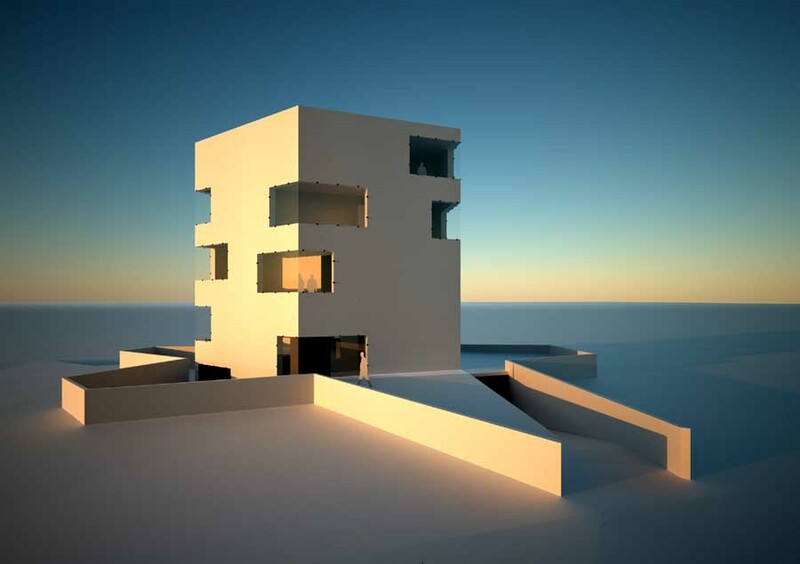 The house starts with the pool at lower garden level and reaches up to the top roof terrace open to the sky. Interior spaces follow the movement, a rising spiral around the structural core, the stairs. As a result the program is distributed on a series of interior terraces that are interconnected visually yet offering seclusion and differentiating space in the section. A low wall defines the garden, we propose birch trees standing in grass lawns, all green in contrast to the sandy dry landscape. Predominant materials are exposed concrete (facades, floors, ceiling and core-staircase), plywood panel on interior walls, etched glass and ceramic for pools. All windows are fixed flush mounted with stainless steel fixtures.